What is Idle PC value? 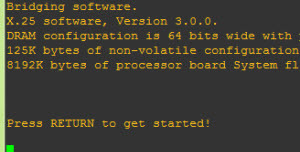 GNS3 Idle PC values are used for controlling and limiting the processor usage of your computer. In backend GNS3 uses Dynamips the software for emulating the real Cisco IOSs. Emulating the real Cisco ISO images causes the high usage and processing of CPU processor to 100%. So here comes the concept of idle PC values, after apply the idle PC value you can minimize the CUP usage. Basically Idle PC values find the intervals/time when the IOS is not executing any instructions and puts the router into an idle state. Which results the decreases in CPU usage on your computer. There are number of ways in GNS3 1.1 & later version for applying the idle PC values. I am going to discuss these method one by one. You can set the idle PC value during adding the IOS image in GNS3. During the IOS adding wizard it will asked you for setting the Idle PC value. Remember this feature is only available in new versions. 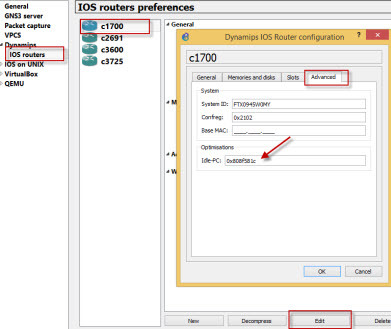 You can add the new IOS for your router from Edit/preference/dynamips/IOS routers. If you want to learn more about adding IOS in GNS3 you can visit here. 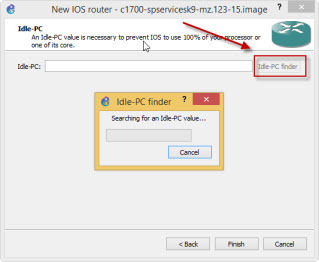 You can change add or change the idle PC value for already added IOS image from Edit/preference/dynamips/IOS routers. Select your router for which you want to change the idle PC and then click on the edit and go to advance tab and put the new idle PC value there. you can also review the following figure for details. You can set idle PC value once you have successfully loaded IOS to the router, when you create a topology in GNS3. After starting the all devices in gns3. Wait a little when the router fully loaded. 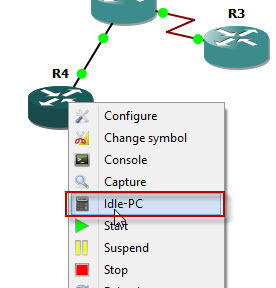 Right click on the router and select Idle PC, GNS3 start calculating the idle PC value for your router. It will take some time for calculating the Idle PC, once it is done you will find different values. Idle PC values with * are recommended so apply any idle pc value with *. After applying the idle PC, if there is not effect on CPU usage then you can retry the same process again. In few cases you have to perform this process for two to three times for getting the ideal value for your router. 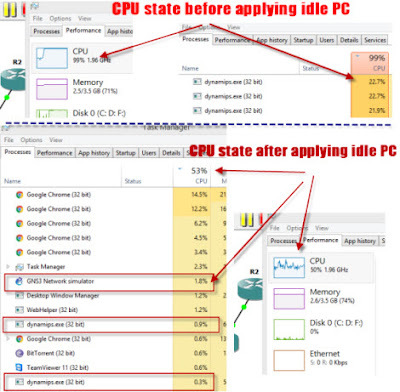 Once Idle PC value has been successfully applied, you will notice a drop in the CPU usage. This happens commonly, what do we do if there is no asterisk symbol near to idle PC value? In such situations, stop the GNS3, close it and start again and then perform the steps again for idle PC. You should repeat this process until CPU usage goes down to10-15%. You can also lower the CPU usage by applying the idle PC value without Asterisk symbol if it reduces CPU usage considerably. I hope this article will help you in lowering the idle PC value of your GNS3. Please share your experience regarding IDLE PC value.